CIA personnel wait as President George W. Bush visits CIA headquarters. As the news of Osama bin Laden's death moves from exhilarating novelty to accepted reality, one group in the U.S. government will emerge as key to the win: the Central Intelligence Agency. From the earliest identification of a Bin Laden courier, the pursuit of leads, the assessment of evidence and the execution of the raid in Abottabad, Pakistan, the CIA can rightly claim the most credit for finding and killing the world's most wanted terrorist. Taking credit for a win is not something the agency gets to do often. 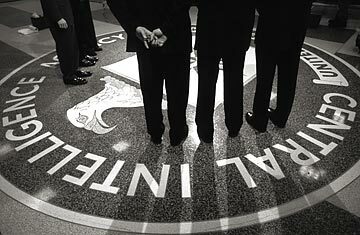 Though on high alert in the run-up to 9/11, the CIA was criticized afterward for failing to connect the dots of existing intelligence on the threat. Years of failed efforts to find and kill bin Laden thereafter embarrassed and frustrated the agency. And reforms intended to fix the CIA's problems remained inconclusive in the public eye, without a win on the issue most important to Americans: bringing bin Laden to justice. From the time that we first recognized bin Laden as a threat, the CIA gathered leads on individuals in bin Laden's inner circle, including his personal couriers. Detainees in the post-9/11 period flagged for us individuals who may have been providing direct support to bin Laden and his deputy, Zawahiri, after their escape from Afghanistan. Four years ago, we uncovered his identity, and for operational reasons, I can't go into details about his name or how we identified him, but about two years ago, after months of persistent effort, we identified areas in Pakistan where the courier and his brother operated. Still we were unable to pinpoint exactly where they lived, due to extensive operational security on their part. The fact that they were being so careful reinforced our belief that we were on the right track. Then in August 2010, we found their residence, a compound in Abbottabad, Pakistan, a town about 35 miles north of Islamabad. The area is relatively affluent, with lots of retired military. It's also insolated [sic] from the natural disasters and terrorist attacks that have afflicted other parts of Pakistan. When we saw the compound where the brothers lived, we were shocked by what we saw  an extraordinarily unique compound. The compound sits on a large plot of land in an area that was relatively secluded when it was built. It is roughly eight times larger than the other homes in the area. When the compound was built in 2005, it was on the outskirts of the town center, at the end of a narrow dirt road. In the last six years, some residential homes have been built nearby. The physical security measures of the compound are extraordinary. It has 12- to 18-foot walls topped with barbed wire. Internal wall sections  internal walls sectioned off different portions of the compound to provide extra privacy. Access to the compound is restricted by two security gates, and the residents of the compound burn their trash, unlike their neighbors, who put the trash out for collection. The main structure, a three-story building, has few windows facing the outside of the compound. A terrace on the third floor has a seven-foot wall privacy  has a seven-foot privacy wall. It's also noteworthy that the property is valued at approximately $1 million but has no telephone or Internet service connected to it. The brothers had no explainable source of wealth. All of this information then went to the CIA's directorate of intelligence to cook into a theory of the case  whether it could be assumed that it was in fact Bin Laden who was likely in the compound, and how confident the President could be that he was sending a strike force in for a worthwhile risk. Intelligence analysts concluded that this compound was custom built to hide someone of significance. We soon learned that more people were living at the compound than the two brothers and their families. A third family lived there  one whose size and whose makeup matched the bin Laden family members that we believed most likely to be with Osama bin Laden. Our best assessment, based on a large body of reporting from multiple sources, was that bin Laden was living there with several family members, including his youngest wife. Everything we saw  the extremely elaborate operational security, the brothers' background and their behavior, and the location and the design of the compound itself was perfectly consistent with what our experts expected bin Laden's hideout to look like. Keep in mind that two of bin Laden's gatekeepers, Khalid Sheikh Mohammed and Abu Faraj al-Libbi, were arrested in the settled areas of Pakistan. More details will emerge in coming days, and there will no doubt be questions about the operation. But for now, the CIA is doing publicly what it hasn't been able to do in quite some time: take a victory lap.